Red and swollen gums that bleed when you brush are known as a condition called gingivitis meaning gum inflammation (gum= gingiva, itis= inflammation) that results from harmful bacteria irritating your gums, causing micro-ulcers that bleed when you brush. When gingivitis is left untreated, in susceptible individuals, it can develop further into a type of infection known as periodontitis, which affects the sporting structures of the teeth causing irreversible bone loss. Eventually this disease will lead to mobility of teeth and associated discomfort and early tooth loss. Fortunately, this can be avoided by having regular dental health checks and hygiene visits. A good daily hygiene routine is of paramount importance and a regime will be recommended by our dental hygiene team for you as an individual. Your teeth and gums will be assessed to determine how efficient your current home routine is by determining the amount of plaque on your teeth. Your current regime will be discussed and helpful hints will be disclosed to ensure you are being as efficient as possible with your valuable time. Any risk factors for gum disease will be highlighted for example smoking, and general health issues such as uncontrolled diabetes and uncontrolled high blood pressure and issues will be discussed. Your teeth will be professionally cleaned with special equipment and pastes, this process is also known as scaling and polishing. The hygienist’s role is to show you how to look after your teeth so you can maintain your oral health as effectively as possible every day. You will be advised on the best toothbrushing technique and products so you can continue to self manage your hygiene programme at home. If you have a bridge, denture, orthodontic treatment or a dental implant you will have specific hygiene needs that the hygienist will be able to assist you with. It is recommended that you attend for regular hygiene appointments to ensure your daily routine is reviewed to your needs to ensure you stay healthy, both from an oral hygiene and, generally. Poor dental hygiene: without regular brushing and flossing, bacteria and bits of food can get trapped in between your teeth, which release an unpleasant odour after some time. Chronic bad breath can often have an underlying medical cause for example infections of the throat, sinuses, gastro-intestinal problems (for example reflux) or sleep disorders and resulting dry mouth. Or Acid from inside your body– for example as a result of certain medical conditions or eating disorders. Toothbrush Abrasion: Overzealous tooth brushing habits (brushing too hard) wears away the protective enamel. For top tips on protecting your enamel and for effective treatment of tooth sensitivity ask your dentist or hygienist at your next dental health check, where we can create an individualised care plan for you. AirFlow Stain Removal is a stain removal system that tackles dark brown, yellow or grey marks on the teeth that are clearly visible but difficult to remove using normal polishing methods. Based on the use of a jet of compressed air, water and bicarbonate particles, the system gently polishes away any surface staining from the teeth, leaving behind a bright white smile that couldn’t have been achieved in any other way. AirFlow is an increasingly popular method of teeth cleaning that is favoured by those with more severe stains, such as smokers or people suffering with genetically darker teeth that require more force to remove stains. Some stubborn food stains are also tackled, and the most common stains that can be removed using AirFlow include tea, coffee, tobacco, wine and curry. The Benefits of AirFlow Stain Removal with the help of a compressed jet, the hygienist can create a bright whiter smile in a matter of moments, making it an ideal treatment to book before a big event or a meeting at work so you can feel confident. 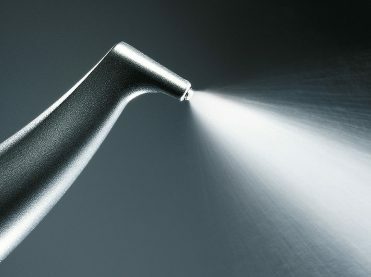 AirFlow stain removal is also a fast and painless procedure, removing debris, stains and plaque. An ideal budget option. AirFlow is an affordable method of removing teeth stains, so you can book the treatment as often as you need without breaking the bank. No. AirFlow is painless treatment that can be completed in around 30 minutes. Just like regular teeth whitening, AirFlow Stain Removal does not require anaesthetic or any other type of pain management, even in nervous patients.